Queensland’s proudest sons Violent Soho have today announced a special Christmas-themed show in their hometown (4122) to be held at the Mansfield Tavern on Saturday 23 December – Santa Is Coming To Mansfield. Tickets are on sale this Friday 17 November from 9am AEST (QLD time). “We’re going all out on the Christmas theme and putting together a VERY different set list. So come and celebrate the festive time of year in our suburb of Mansfield in Brisbane Queensland Australia with us. It’s going to be one for the ages!” the band explain. 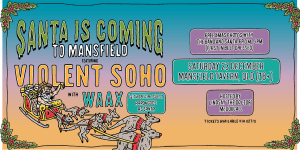 Hand-picked by the band themselves, support on the night comes in form of Brisbane five-piece WAAX (http://waax.band/) . Fresh off the road from a sold out headline tour and a national tour supporting Dune Rats, WAAX are currently riding a wave of success off the back of their recently-released EP Wild & Weak, a string of radio anthems and one of the greatest live shows from an emerging band you’ll see this year. The other entertainment for the night comes in the form of Aaron Gocs (https://www.facebook.com/AronGocs/) who, apart from being dressed as Santa (and is ‘funny as f*ck’, in Soho’s words), will be displaying his renowned comedy routine. Last but certainly not least – the night will be hosted by a man who is no stranger to the stage (and just so happens to be the band’s hero), Lindsay McDougall (Frenzal Rhomb, ex-triple j). As an early Christmas present to fans attending the show, the band will be hosting a FREE Christmas-themed photo shoot with both the band and Santa (played by Aaron Gocs) from 5pm on the night. Spots for the shoot are limited (first in, best dressed) and available to ticket holders only. 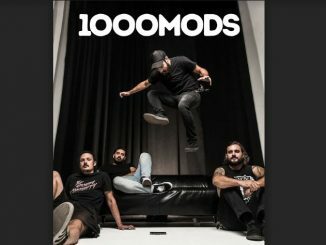 More details on the shoot will be released via Violent Soho’s socials closer to the show. Keep an eye out! The past 18 months have been an absolute whirlwind for Violent Soho since the release of their fourth #1 album WACO. They have toured the country as part of Laneway Festival, hosted multiple sold out national headline tours with line-ups featuring The Bronx, Dune Rats, DZ Deathrays and Luca Brasi and performed at the 2016 ARIA Awards – where they took home two awards for Best Rock and Best Group. They’ve also been nominated for Best Live Act at this year’s ARIA Awards.